Home > “Too Normal” for a Goalie? Merric Madsen was the brick wall in net for last season’s Frozen Four team. And yet, when you ask Madsen to think back on the season that took his team all the way to the Frozen Four, the first game to come to mind for him is an earlier, less glorious contest: a late November matchup against Boston University. At that point in the season, Harvard was 5-2-1; they’d had a couple of significant games, but most were still to come. “We had been playing pretty well, a few blips along the way,” he says, “and we were in a tight game against BU—we always play a tight game against BU—and then we ended up losing.” The final score was 5-3. A couple of the Terriers’ goals were flukey, a weird bounce from the corner, a puck that chipped in off Madsen’s stick. Still, he says, he should have saved those. He remembers thinking afterward that what he was giving the team wasn’t enough, that he would have to work harder, play better, dig deeper. “I carried that with me through the year,” he says. He wasn’t always so at ease. “People say goaltending is 10 percent physical, 90 percent mental,” Madsen says. The 90 percent is the hard part. “When your teammates are successful, it shows up on the scoreboard. You celebrate. As a goalie, when you’re doing things right, it just means you’re doing what you’re supposed to do. No one is exactly supposed to go out and score a hat trick every night, but every single shot, broken down one by one—I should be able to save almost all of them.” The confidence to do that took time to grow into. Madsen was raised mostly in southern California—more of a hockey region than people realize, he says—and learned to skate at four years old; he started playing hockey a year later. He wasn’t a good skater at first, he remembers, and he hardly scored. Then his team’s goalie aged out of the league and his father, a former player himself, suggested he try out for the role. Instantly, he became a better hockey player. The net was where he belonged. He stuck with it, and in high school became one of the best players on his team. 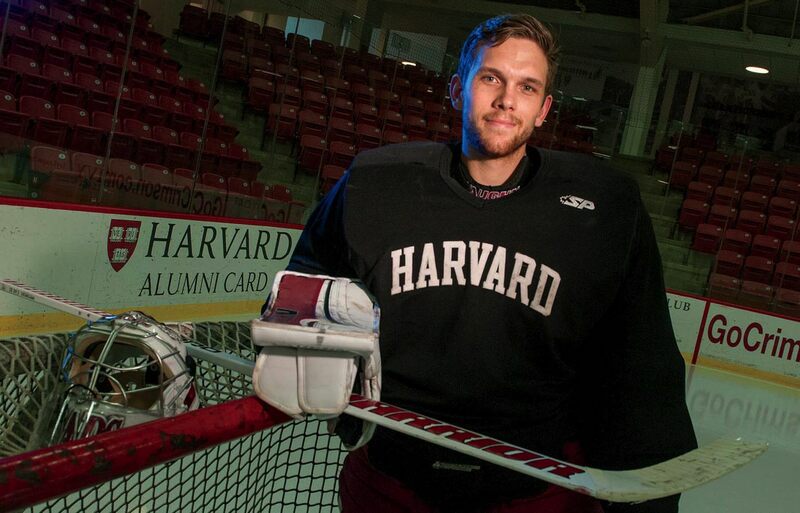 Then he came to Harvard and played in only one game his freshman year, a 5-1 loss to St. Lawrence (goalie Steve Michaelek ’15 was the senior star that season). “And that was kind of it,” Madsen says. “It’s tough to come in and not be that guy anymore, the guy who starts every game.” He recalls going to Donato and the other coaches that year, thinking that if they’d just put him in another game, he could find his confidence again. “And I remember Coach telling me something I’ll never forget: he said, ‘You’ll never get confidence from us.’ That the way you get confidence is within yourself, and once you find it there, then you’ll be able to play. I’d never thought about confidence that way,” he says. “My coach was telling me I had to do more work,” build strength, physically and mentally. Donato remembers that moment too. “We were trying to light a spark in him,” he says. The next year, Madsen found himself competing against incoming freshman Michael Lackey, who’d played internationally—and won medals and accolades—with the U.S. National teams’ under-17 and under-18 squads. They split the season between them, Madsen taking the lion’s share—“We were each pushing each other,” he says—and then last year he locked down the job, starting all 36 games (Lackey was right behind him as backup). It was an incredible season, which ended at the Frozen Four in Chicago, where Harvard lost to Minnesota-Duluth, which then lost to the eventual NCAA champion, the University of Denver. From late January until early April, though, the Crimson had not dropped a game. They ended the season at 28-6-2.